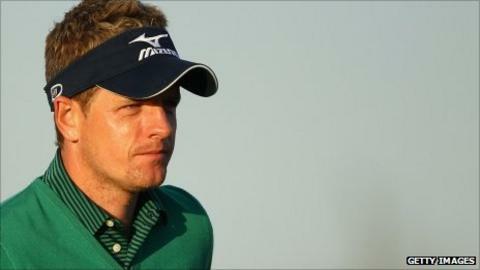 England's world number one Luke Donald remains hopeful of becoming the first player to top both the European and US money lists in the same season. Donald, who leads in Europe by more than one million euros, needs a top-two finish at this week's season-ending PGA Tour event to keep his US dream alive. America's Webb Simpson tops the US list and the duo have been paired together for the first two rounds in Florida. "Everyone knows why I'm here and I'll give it my best shot," said Donald. He added: "It would be great to go out there and try and win this event. Hopefully that would be good enough to win the money title." Donald had not planned on playing in the final four events of the PGA Tour season but made a late decision to compete in the Children's Miracle Network Hospitals Classic at the Disney World resort after Simpson overtook him in the standings. Should the 33-year-old win in Florida, Simpson - who leads the standings by $363,000 - would need to finish runner-up on his own to stay on top. If Donald is second, or tied for second, Simpson needs a top eight or top 21 finish respectively to take the overall title. Despite holding the advantage, Simpson knows he is facing a tough weekend. "It's clear that for all practical purposes - and I think most guys would agree - that he [Donald] is the best player in the world," said the American. "To have the success he's had - winning on both Tours, being on top of the money lists most of year - is really incredible, especially since he has a family. "They've been travelling with him and he's just done an incredible job of balancing it all together. "I think he's had 13 top-10 [finishes] out of 18 starts on our Tour. "He's got such a great short game - he makes big putts when he needs to. "All year he's played so consistently. He's been great to watch. "We've had similar years. He's had a few chances to win and won once [in America], I've had a few chances to win and won twice." Donald leads Northern Ireland's Rory McIlroy by more than one million euros (£870k / $1.37m) in Europe's Race to Dubai, with two months remaining.